When Dane heads to South Carolina to meet an uncle he’s never known, he doesn’t expect his whole life to change in a few short weeks. Dane’s family legacy is almost as complicated as the feelings he has for the young man who works at Dane’s family inn. I wanted this to be a m/m Nicholas Sparks-style read but it just didn’t quite hit the mark for me. Dane and Brook recount their life struggles to each other but I didn’t ever really feel the emotions behind their lives. This is also a little bit too insta-love for me – it’s a book where the connection feels more convenient than fated. Dane is ready to settle down and Brook is living in a town with few gay men. I didn’t feel sparks, I just saw a tidy happily ever after. Romance wise, the story skips from attraction to settled without many romantic moments or relationship building in between. Dane’s family life is messy, but the book only just manages scratch the surface of his relationship with his dad and his uncle. I wanted more depth and more relationship building. Most of the action in this book takes place within a few weeks with the epilogue almost listing fairly superficial resolutions to Dane’s problems. I expected to enjoy this story much more than I did. I hope other readers have more positive reactions to the book. 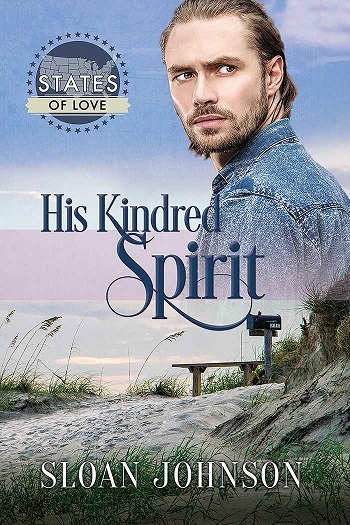 Reviewers on the Wicked Reads Review Team were provided a free copy of His Kindred Spirit (States of Love) by Sloan Johnson to read and review.